For holiday entertaining or a football gathering, provide the foundation and have your guests build their own. Whether it’s just a quick bite on the go or a carefully constructed masterpiece, one thing is clear: we love our sandwiches in America. Sandwiches are just as much a part of the fabric of American cuisine as pasta is to Italian food. Sure, the name might change as you move around the country. It might be called a grinder in New England, a sub in southeastern Connecticut, a hero in New York City, or a hoagie in Philadelphia…but as long as you layer bread with delicious toppings, it’s a sandwich. Sandwiches are classic tailgating fare during football season, but did you realize that the sandwich actually originated in England? John Montagu was an English nobleman and the 4th Earl of Sandwich. (Sandwich is a historic town in southeastern England.) John liked to play cards with his friends for hours upon end. In order to continue eating while playing cards, the earl asked his staff to bring him meat tucked between two pieces of bread. And thus, the sandwich was born. As we gather to celebrate the holidays with family and friends, we can learn something from John Montagu. Instead of a traditional buffet or a full sit-down meal, consider arranging a charcuterie board instead. Sandwiches are a fun way to entertain guests without stopping the game to serve a meal. In fact, we can take the sandwich idea one step further. Instead of making sandwiches ahead of time, let everyone make their own. When building a charcuterie board, Patti recommends starting with two or three different salami. Selecting salami of different sizes, shapes, and colors not only offers guests more variety, but it also makes the board more visually appealing. 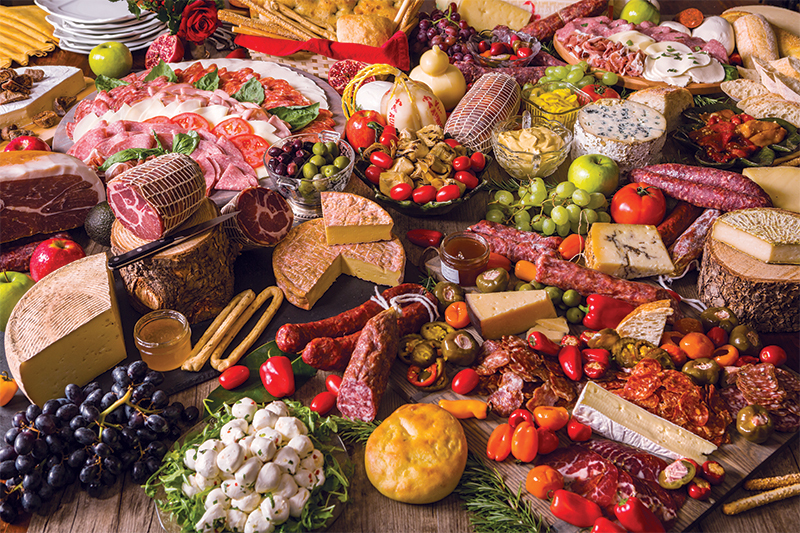 Depending on guests’ taste preferences, a charcuterie board might start with a traditional Genoa salami, a dry-cured Abruzzese salami, and perhaps a red wine and garlic salami or a spicy Soppressata. Patti is a third-generation Italian American sausage maker, and she takes pride in the fact that her salami recipes are the same ones her grandparents brought with them when they emigrated to America from Calabria, Italy more than 125 years ago. Her salami, which are all natural and nitrate free, have received several national accolades and awards. A stop by Fortuna’s Sausage is a great way to start building your charcuterie board for the holidays. Cheese is another essential part of any good charcuterie board, and Vermont has plenty of excellent cheeses from which to choose. If you’re keeping with the Italian theme, a sharp provolone cheese is always a good choice. Add in a young Pecorino (aged less than 4 months if you can find it) and some Parmesan (Parmigiano Reggiano), and you’ve got yourself an excellent trio of cheeses. And don’t forget to grab a little bit of honey for drizzling on the Parmesan. At this point, that charcuterie board is almost done. Finish up by adding some of your favorite condiments (olives, roasted red peppers, marinated mushrooms, or marinated artichokes), breadsticks, and some fruit (figs, grapes, or apples). Now you’ve got a holiday appetizer board that is not only delicious, but also filled with the perfect fare for nibbling while watching football. Oh, and don’t forget the bread. A sandwich is only as good as the bread it’s built on, and an assortment of different breads is the perfect way to round out a good charcuterie board. Semolina, focaccia, baguette, or boule—all are excellent choices when it comes to bread for sandwiches. Speaking of bread, Al Ducci’s Italian Pantry in Manchester is a one-stop shop for gourmet and specialty foods. 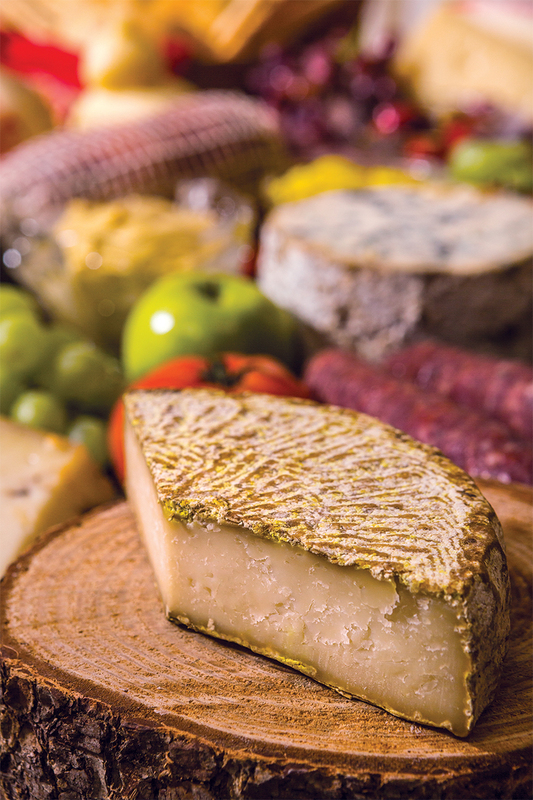 From local cheeses to homemade breads, Al Ducci’s is a great place to visit when looking for unique foods for holiday entertaining. As an alternative to building your own charcuterie board, Al Ducci’s also has a full deli and catering menu. Sherrie Baker, one of the owners, notes that the Italian 3-Meat Sandwich and the Italian Veggie Combo are both popular choices. If you’re looking for classic Italian fare, then Al Ducci’s needs to be on your radar. That charcuterie board filled with your favorite meats, cheeses, and other toppings goes hand-in-hand with football. Indeed, some of your guests might even argue that the food is even more important than the game. Finger food is the name of the game, so don’t forget to add some other fun side dishes to the table, too. Dips are a classic football food, but no one wants to get stuck at the snack table when their favorite team makes the play that wins the game. 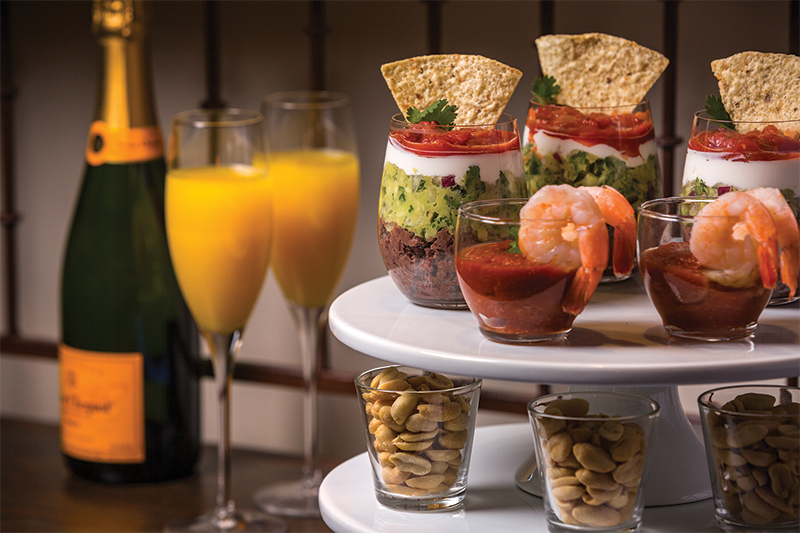 Solve that problem with these fun, layered snack glasses. To make these Mexican Layered Dip glasses, simply grab some small glasses and fill ’em up with your favorite dips. (Tip: Stemless wine glasses or larger votive glasses work well.) Guests can pick up a glass to go so they don’t miss a minute of the action. Make an easy 4-layer dip with refried black beans, guacamole, sour cream, and salsa. Each of these layers could be made with store-bought dips, but there’s just something about homemade guacamole. Pick up some fresh avocados, cilantro, and a couple of limes at the store, and you’ve got the basics for a delicious batch of this classic football food. Shrimp cocktail is another fan favorite when it comes to classic party appetizers. However, like dips, shrimp cocktail can be challenging to eat while watching football. The last thing you need is cocktail sauce spilling on the floor after your team scores the winning touchdown. Solve that problem by making individual glasses of shrimp cocktail for your guests to get as they head back to their seats. Just add a little cocktail sauce to the bottom of a small glass. Insert several large cocktail shrimp, and you’ve got a fun appetizer ready to go. A bonus appetizer idea is to use leftover ingredients from the charcuterie board to antipasti skewers. We used medium-size cocktail skewers and arrange several meats and cheeses on each one. Not only are these skewers a fun addition to the appetizer table, but they also take advantage of ingredients that you already have on hand. Holidays are all about spending time with family and friends. Fresh snow settles on the mountainside while a roaring fire in the fireplace keeps us warm inside. As uncles, aunts, brothers, sisters, grandparents, and cousins all arrive to celebrate the holidays, consider welcoming everyone with these fun appetizers. From the charcuterie board to the dips and skewers, these easy snack ideas are the perfect way for guests to grab a snack without missing a minute of the game. Whether college or professional, there’s no shortage of rivalry football games during the holidays, too. Everyone has their own team loyalties… even if it means that Aunt Ethel and Cousin Bob are pitted against each other for the afternoon. But isn’t that what makes the holidays fun? Those friendly rivalries coupled with spending time with distant relatives lead to memories that last a lifetime. 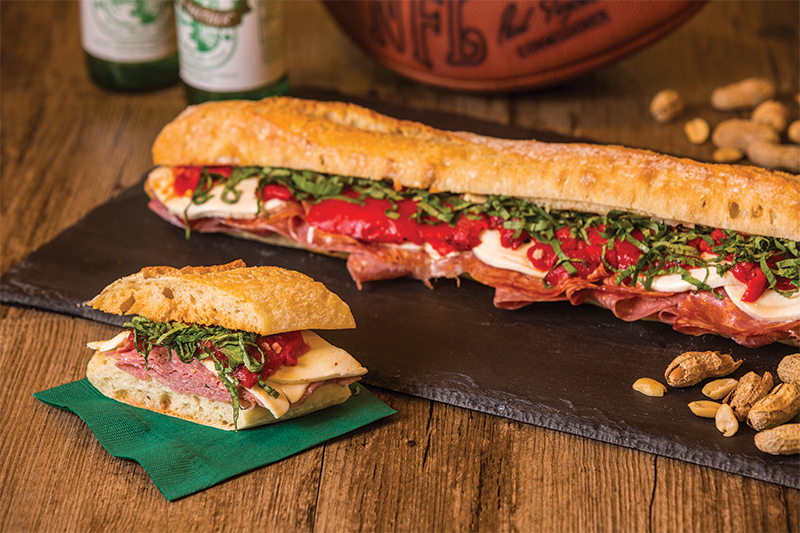 So, grab a sandwich, turn on the big game, and enjoy the holidays. Cheers! Add all ingredients to a medium mixing bowl. Using a fork, mash until well combined.